This two part article provides an overview of the use of alternative gaseous fuels in reciprocating engines. Part 1 looks at fuel characteristics, noting how their use can influence engine performance, whilst part 2 will look at some fuel treatment options to avoid some of the common problems encountered with these fuels. Roger Allen. With the pressure on energy supplies and the trend towards renewables we have seen a rapid rise in the use of alternative gaseous fuels for power generation, such as landfill gas, sewage gas, biogas, shale (frac) gas, associated petroleum gas, coal bed/mine methane, and gases from process plants. The term "biogas" is used generically to refer to any gas produced by the breakdown of organic matter in the absence of oxygen, ie, via anaerobic digestion. This includes gas from landfill, sewage treatment, or waste water treatment plant. However, it also includes gas produced by anaerobic digestion using green waste, plant material, crops, etc. Care must be exercised when viewing data to ensure that the correct form of biogas has been identified. In this article biogas refers to plant derived gas. Individual sources of alternative gases are typically small compared with natural gas sources, which suits reciprocating engines. Utilisation of these alternative gases for electricity production is not new but problems encountered in the past have a habit of reoccurring with each new generation of engineers; it is hoped that this article will clarify some of the questions frequently asked when evaluating the economics of such power schemes. The variable sources/feed stock producing these gases results in gas compositions that are equally variable. The values shown in Table 1 are, therefore, indicative, not absolute, and represent typical mid-point values; they should not be used for design, where actual gas analyses should be used. Natural gas is included for comparison and since it is widely used for small scale power generation. It should also be noted that natural gas at the oilfield, even after any upstream processing in the field, is very different from that delivered to a consumer through a distribution network. In Table 1 all gases with a similar Wobbe index, which is an indicator of the interchangeability of fuel gases, will burn satisfactorily in boilers and other continuous combustion devices with comparable physical characteristics. A modified Wobbe index is used by some gas turbine manufacturers. However, Wobbe index is not appropriate for discontinuous combustion devices such as reciprocating engines operating on gas, where methane number becomes the controlling parameter if auto-ignition, commonly called "knock", is to be avoided. Methane number is based on a scale of 0 to 100, with 0 representing hydrogen (very poor anti-knock properties) and 100 representing methane (good anti-knock properties). It has to be stressed that methane number is not derived from a rigorous calculation but stems from experiment, resulting in empirical methods for practical use; these carry many caveats and therefore have to be used with care. Reference 1 describes a widely used method for methane number determination but even this has its limitations in that high concentrations of inert gases are outside the test limits. The basic caveat for using such experimental data is that the gas mixture in use must be similar to that used during the test; extrapolation outside the test parameters is not permissible. Some large engine manufacturers make software available for the calculation of methane number but the results often differ from one manufacturer to another. Most large manufacturers do, of course, have a significant track record of engine applications and use their historic data to decide the suitability of the gas for use in their engines. Methane number as a measure of the knocking characteristic of the fuel is for gases what octane number is to gasoline (petrol) and cetane number is to diesel fuel. Auto ignition (also called self ignition) is a very complex subject but put simply is a form of abnormal combustion. It occurs when the unburnt gas/air mixture attains conditions of pressure and temperature sufficient to cause spontaneous ignition in the form of an explosion rather than the smooth and progressive combustion intended. This results in a rapid pressure rise, much larger than the design value, which can be heard as a knock and can cause severe mechanical damage. The magnitude of this pressure rise can be seen in Figure 1 (source Reference 2). Note the very much higher pressure experienced by the cylinder/piston during knock than during normal operation. Such pressures are not sustainable and ultimately result in damage, particularly to the piston. Also, note the "knock" line is not smooth but jagged reflecting the rapid pressure changes being experienced. Avoidance of knock is critical if the engine is to be reliable. Two of the major factors influencing knock, over which there is little control for an existing engine, are fuel methane number and engine compression ratio. Engine timing is a third factor but is adjustable in the field and taken care of by the engine control system. There is currently a strong desire to increase compression ratio since in general the higher it is the higher the engine efficiency. However, increasing compression ratio will ultimately induce knock unless the fuel has a suitably high methane number. This can be seen in Figure 2 (source Reference 3) which sets out the measured maximum compression number for a given methane number, the red triangle indicating the critical pressure ratio for (pure) methane (Reference 4), with a methane number of 100. Few engines operate on pure methane and, so, even engines on delivered natural gas (H in Table 1) typically operate with a compression ratio around 10. Thus, methane number limits engine compression ratio, which in turn limits efficiency. Table 1 also shows that the methane number is much higher for gases A, B, C than D, E, F, G and H. This is mainly due to the much higher levels of inert gases (mainly carbon dioxide and nitrogen) in gases A, B, C. It has been shown (Reference 2) that every 10% increase in carbon dioxide in the fuel increases the permissible compression ratio by one point (eg increases CR from 10 to 11), and every 25% increase in nitrogen in the fuel increases the permissible compression ratio by half a point (eg, CR increases from 10 to 10.5). Also the presence of long chain hydrocarbons reduces the methane number, as in E, F G. However, the low calorific value gases (A, B, C) do gain some ground, compared to higher calorific gases, since the presence of inert gases increases the methane number, thereby allowing increased compression ratio and, hence, efficiency. Engines operating on gases A, B and C can operate with compression ratios of up to about 18 but if there is an attempt to raise engine brake mean effective pressure (BMEP) too high problems can occur. It has been found (Reference 5) that BMEP values in excess of 20 bar can trigger knocking within a given range of advanced timing crank angles even with the appropriate methane number. Thus the real question for users is what compression ratio is acceptable for a given gas since it has such a significant impact on engine efficiency and, hence, cost/kW of the engine. This is a complex question and is not made any easier by some manufacturers not making compression ratios known to their clients. However, Figure 2 indicates the limit that should not be exceeded, at least without very special consideration, for a given gas methane number. It must be borne in mind that all alternative fuel gases, including all those in Table 1, see significant variations in methane number both with feedstock and time. Therefore, when considering engine selection a realistic methane number should be used. Generally speaking any gas with a methane number lower than about 70 to 80 requires special consideration since it may require an engine with a lower than normal compression ratio or derating of a standard engine. Selecting an engine that is suitable for the composition of the gas to be used is obviously critical but it doesn't end there. Table 1 shows the major compounds in typical gases but all gases also contain unwanted compounds and contaminants, many of them at very low levels of concentration which can, nonetheless, be harmful to the engine or the environment. The type of unwanted compounds will depend very much on the gas source, as shown in Table 2, which summarises the consequences for the engine of unwanted/trace compounds and elements in the fuel gas. As the above indicates, engines are fastidious and many problems exist if suitable measures are not taken to provide the correct fuel. Given the choice most engine manufacturers would opt for a fuel that is a single pure component, such as methane, thereby eliminating possible problems. 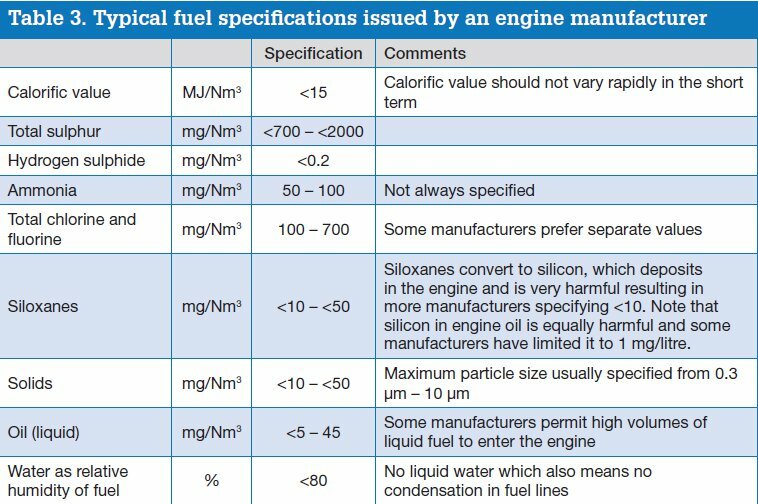 This is clearly not possible, so engine manufacturers issue fuel specifications similar to Table 3, which shows a typical example. This table can only give an approximate indicator of permitted fuel properties. Each individual manufacturer will have its own set of specifications but are unlikely to vary widely from the above. The calorific value (CV) is clearly critical since it determines the electrical output and, hence, the economics of the project. For low CV gases this can be a problem since fluctuations in gas CV may take the actual CV below that permitted by the manufacturer. The present author has experience of this, and overcoming the problem, by adding other fuels, particularly waste liquid fuels, to low CV fuels such as landfill gas. In the latter case this enabled production of power to continue down to ~8% methane v/v thereby prolonging the life of the facility and avoiding gas flaring which has its own problems if the site is close to domestic properties. It should also be noted that the cost of removing trace compounds can influence the economics of electricity production and change the choice of prime mover: engine vs turbine. Danish Gas Technology Centre a/s, Algorithm for methane number determination of natural gases 03-06-99. S. O. Bade Shrestha and R. Rodrigues, Effects of diluents on knock rating of gaseous fuels, Proc. Instn. Mech. Engrs. Vol 122 Part A: Power and Energy. M. Malenshek and B. O. Olsen, Methane testing of alternative gaseous fuels, Fuel 88 (2009) 650-656. T. W. Ryan, T. J. Callahan and S. R. King, Engine knock rating of natural gases - methane number, J Eng. Gas Turb Power 1993; 115:769-76.